Historically, VMware environments have been limited to running in on-premises data centers. This is no longer true with VMware Solutions in IBM Cloud. You can now use your VMware licenses in a cloud-friendly monthly subscription model, including full vSphere and vCenter options. 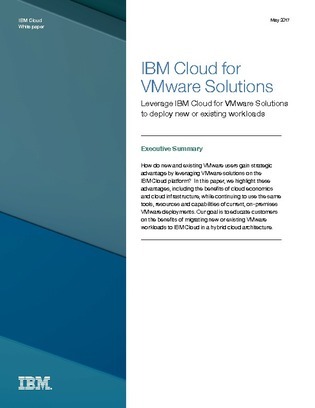 Open this whitepaper to learn about all of the benefits of running VMware solutions in IBM Cloud, including scalability, security, and monitoring.